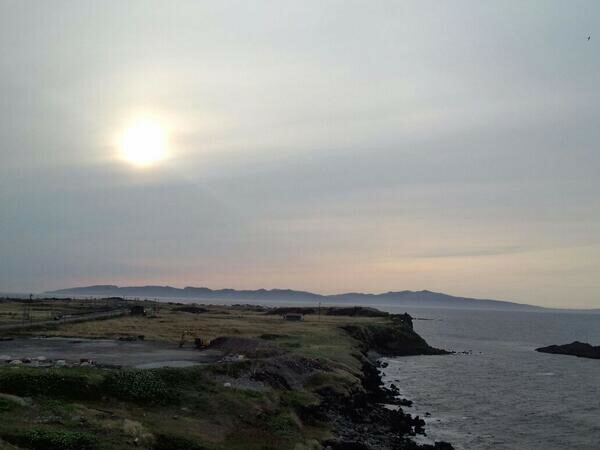 Rishiri Island has a wide array of scenic spots! 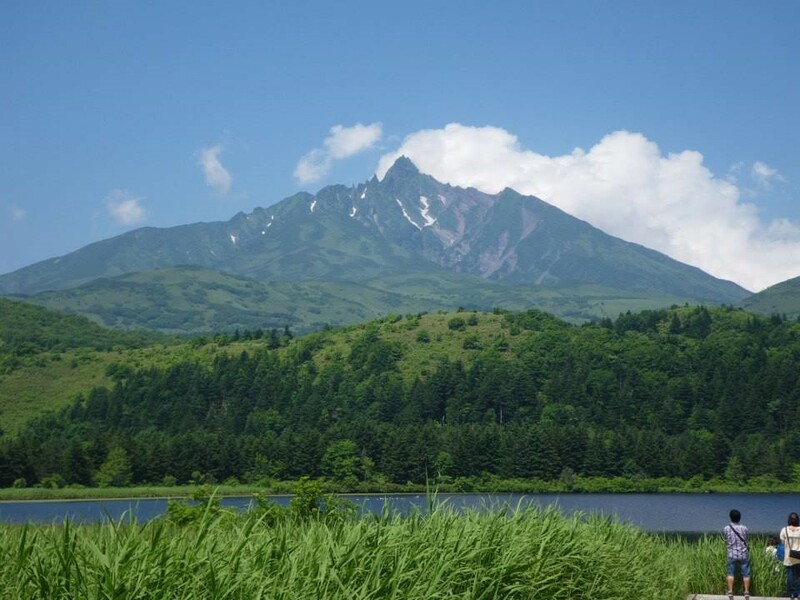 One of these scenic spots Mount Rishiri, the same mountain found on the packaging of the famous Shiroi Koibito biscuits from Hokkaido. Equal in beauty is the reflection of the mountain on lake waters. A beautiful sun setting along the coast is a breathtaking sight. 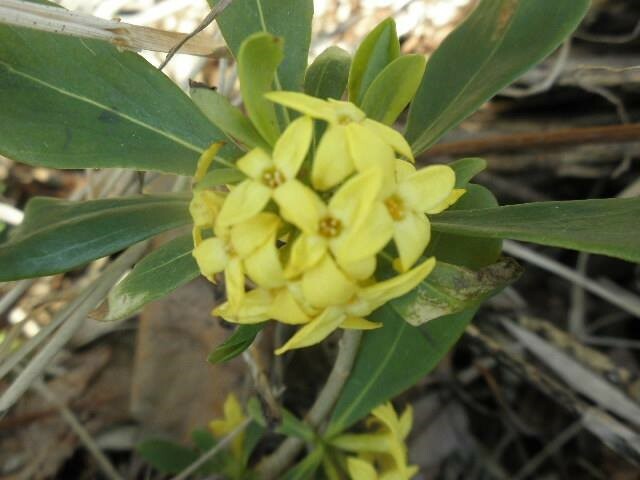 Mountain plants bloom all over the island. 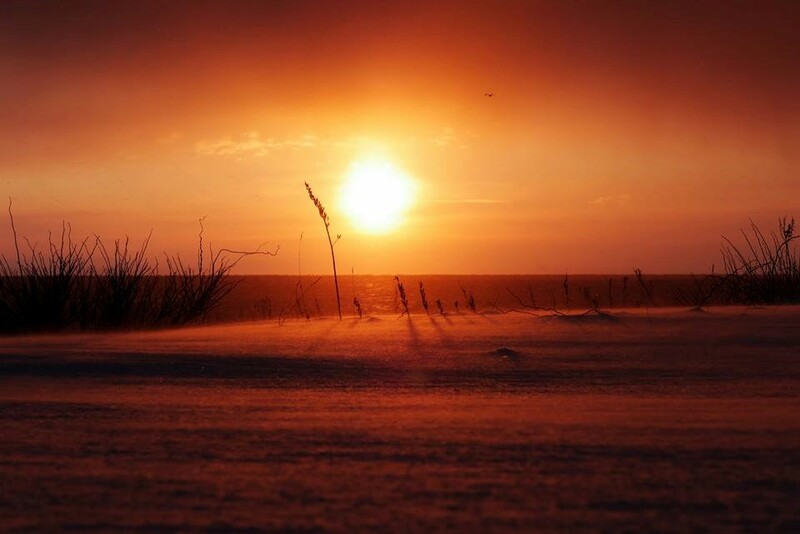 Rishiri Island is the northernmost of Hokkaido’s main island and lies about 52km Wakkanai. The circumference is approximately 63km. A circle around the island by car takes about 2 to 3 hours. 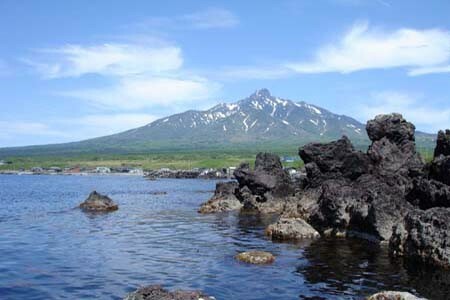 Mount Rishiri, the symbol of the island, has an elevation of 1721m. 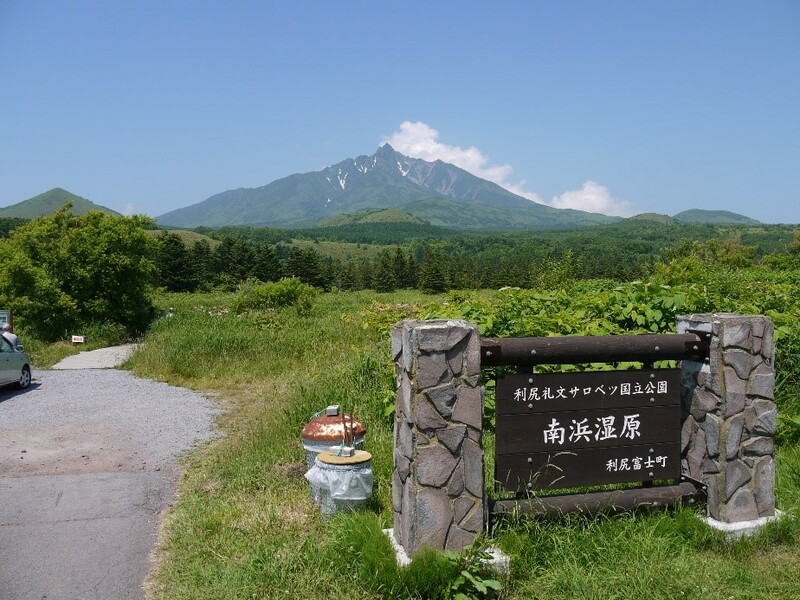 Centered around this mountain are an array of natural sightseeing spots. 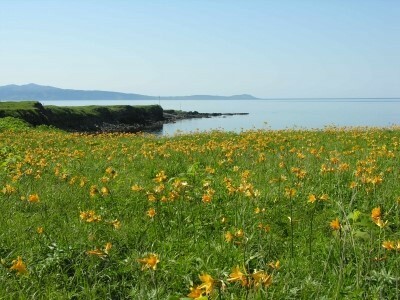 Rishiri Island’s “best season” is similar to that of its neighbor, Rebun Island and runs from June to October. 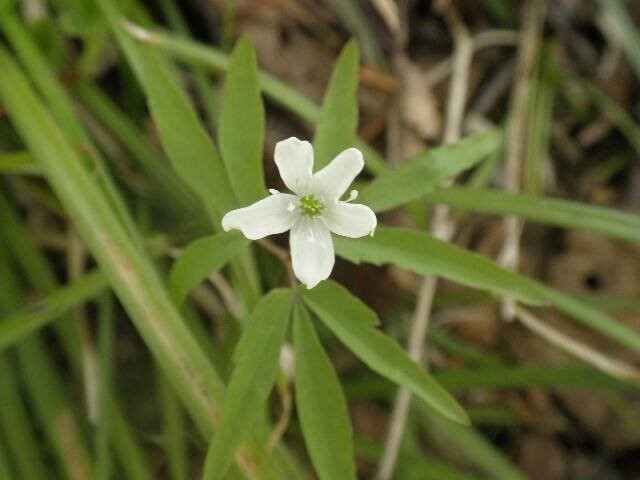 Beautiful alpine plants can be found on both Rishiri and Rebun island. 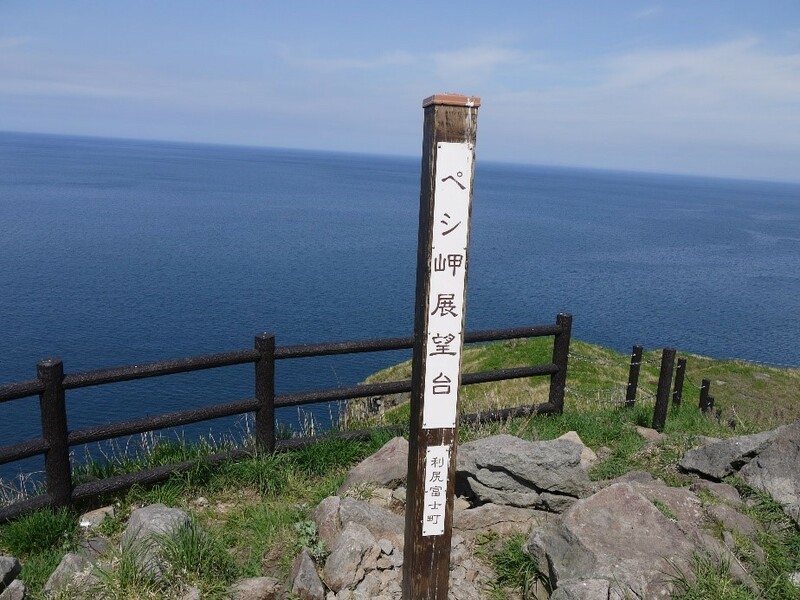 Rishiri Island well-known for its sightseeing destinations while Rebun Island is more known for its trekking experiences. 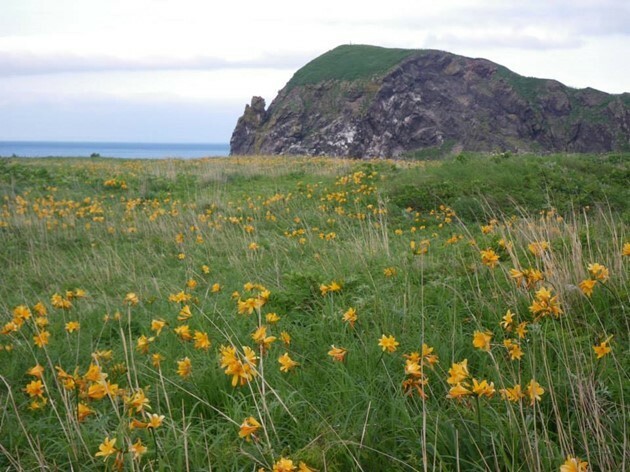 If you are particularly interested in the alpine plants of Rishiri Island, the best months to visit are July and August. 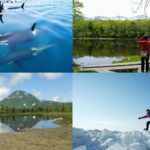 There are specialties (*see below) that can only be seen from June through August, and only in summer do the mountain snows melt to allow for serious hiking. It can snow at times during late September. Rishiri Island has its own airport, so visitors can access the island by both plane and ferry. However, visiting by plane is not recommended. There are few flights, so visitors will be forced to plan their entire schedules around flight times. You might even give up because of time constraints! The ferry is the most convenient option. It has long hours of operation from the early morning into the night. Many tourists make use of the ferry. 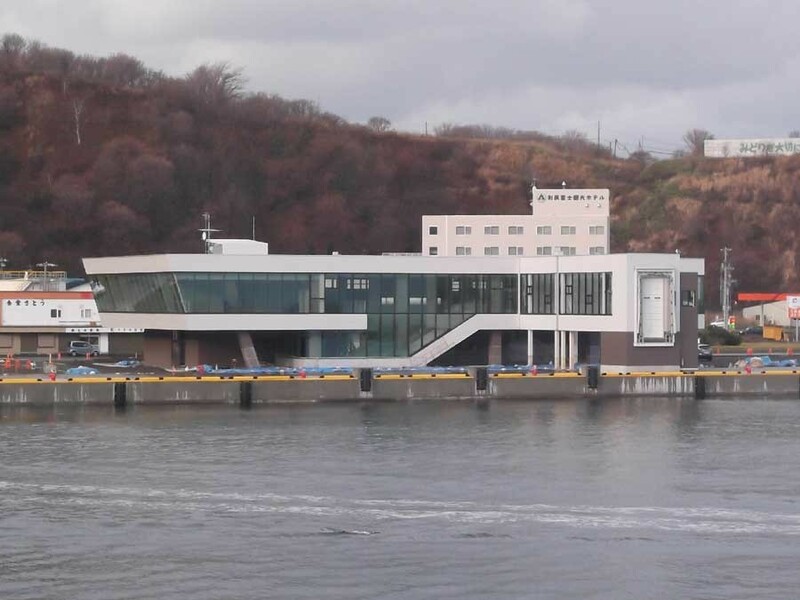 A popular route is to ride the ferry from the Heart Land Ferry Terminal, which is a 5 minutes drive from JR Wakkanai Station. 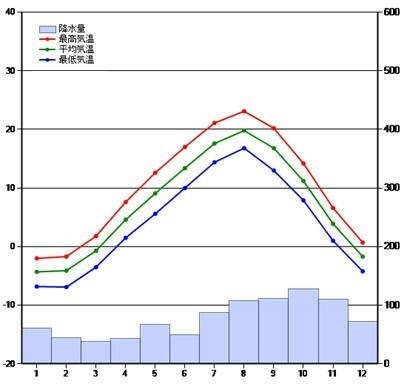 The ferry ride to Oshidomari Port takes around 1 hour 40 minutes. 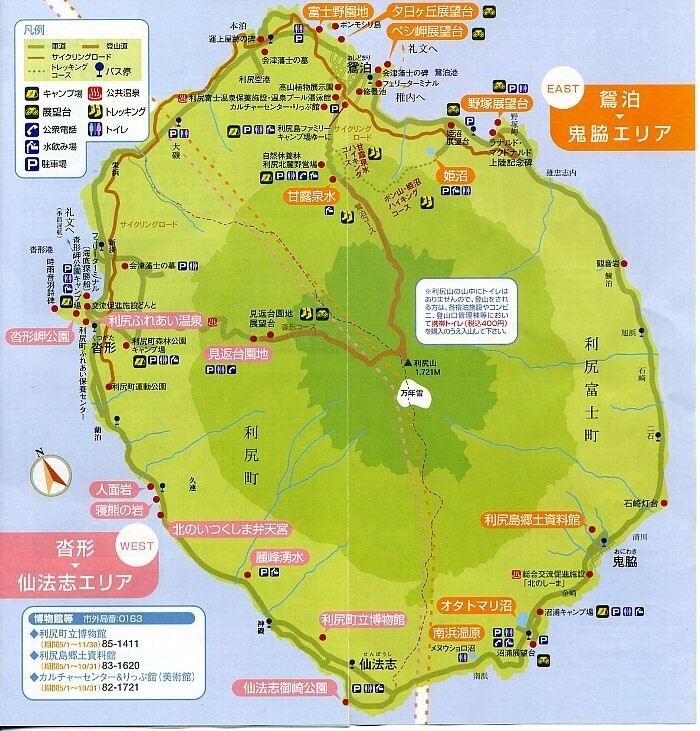 Another option is to cross from Wakkanai to Rebun Island (~2 hours) and then tour Rishiri Island afterwards. 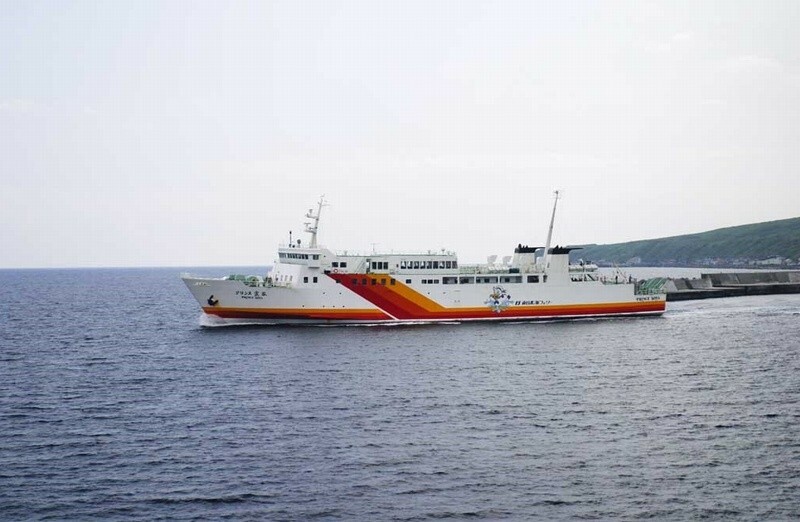 During the 2015 busy season from May 21 to September 30, there were 3 round trip ferries per day between Rishiri and Rebun Island. One of these ferries arrived and departed not from Oshidomari Port but from the Kutsugata Port Ferry Terminal located on the other side of the island. Make sure you know where your ferry’s destination before riding. The circumference of Rishiri Island can be driven by car. 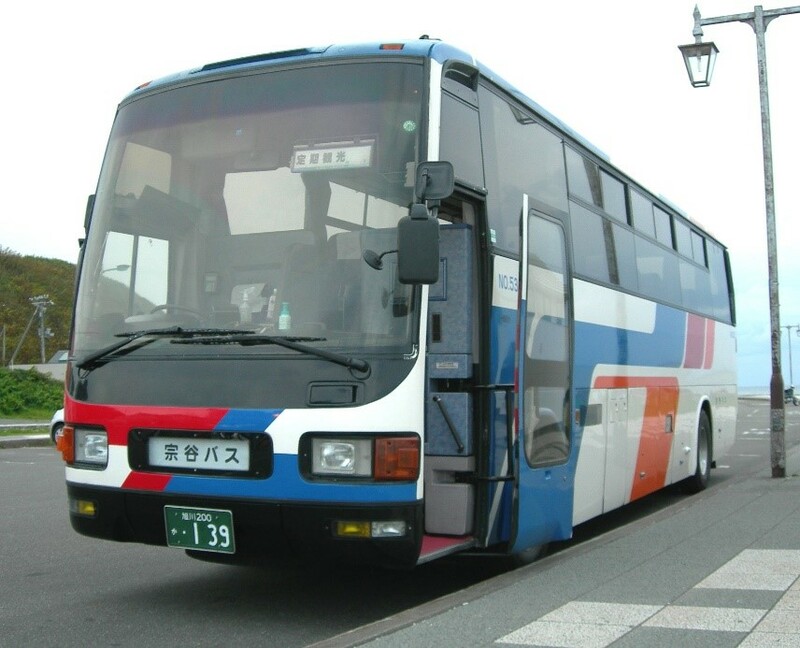 The main forms of transportation are bus, rental car, fixed-term tourist buses and taxi. Now, let us look at each of the modes of transportation individually! 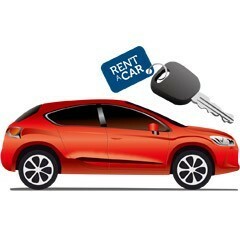 Take complete control of your time using a rental car. However, reservations start filling up from July when the tourism season starts, so be sure to reserve early. *If you have the money for it, you can also rent car in Wakkanai or elsewhere in Hokkaido and bring the entire car onto the ferry. With a local-driven taxi, you might be introduced to some little-known local spot. Enjoy your stay with the warmth of the Rishiri locals. The regular tour bus planned and operated by Soya Bus is a popular option every year. See the important spots in the morning and finish by noon. The afternoon is yours to do with as you wish. 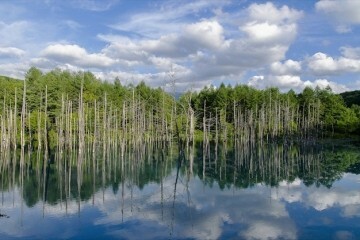 Himenuma is a forest-surrounded lake that finds its charm in its peaceful atmosphere. Fairly small with a circumference of only 1km, walkers can circle the lake in about 20 minutes. On fair weathered, windless days, the mountain can sometimes be seen reflecting off the lake’s surface. The best time to see this is the morning, when the sun doesn’t hit the water directly. 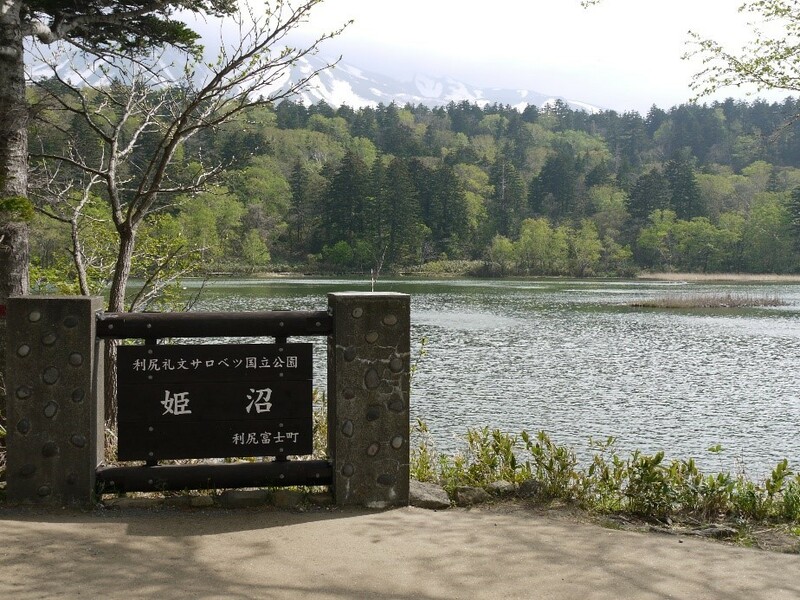 The lake is located directly north of Mount Rishiri’s summit, and the view from the lake of the mountain rising beyond the virgin forests is a sight to be seen. Actually, this lake is manmade. The name Himenuma comes from how 3 original lakes were dammed in order to discharge kokanee salmon (called [[[HIME　MASU]]] in Japanese). The largest lake on Rishiri Island, its beauty does not lose to that of Himenuma. 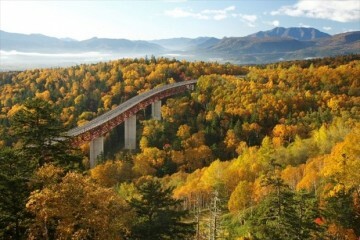 Particularly beautiful are the Sakhalin spruce forests that envelope the lake. 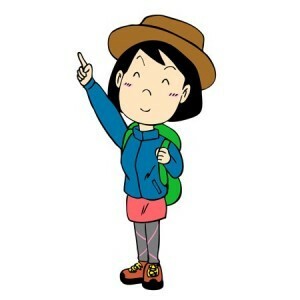 Just like Himenuma, Otatomari also has its own walking course. 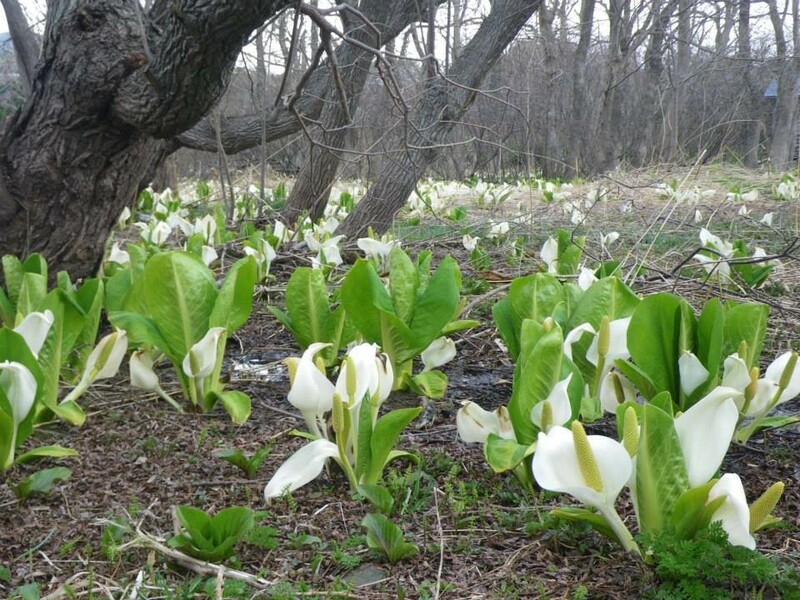 Enjoy skunk cabbage and keyflowers that bloom along the path. The lotus flowers blooming on the lake waters are beautiful too. 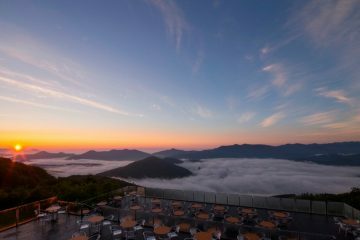 From here, visitors can gaze out from the viewing platform at Mount Rishiri at almost the same angle as that found on the packaging of the famed Shioroi Koibito biscuits. 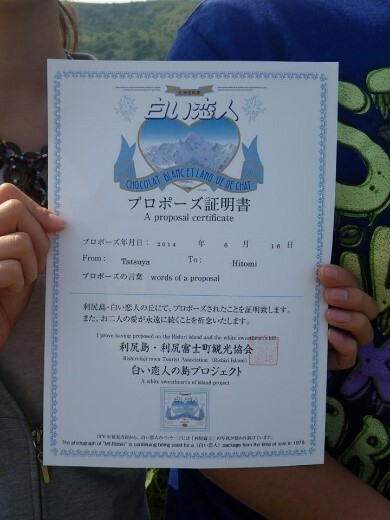 You will be awarded a Proposal Certificate with the language of proposal written on it. Register at the Oshidomari Terminal Tourism Information Desk. 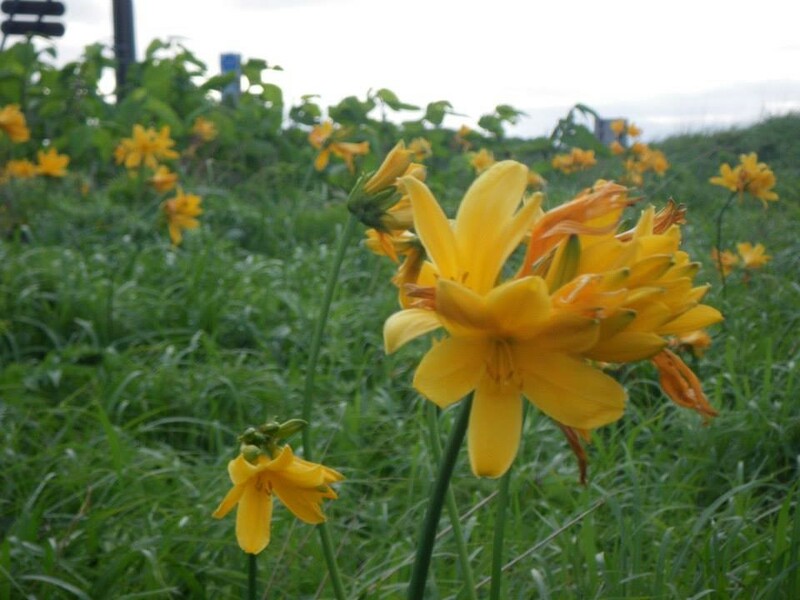 The Fuji Field Garden is popular as a natural blooming location for Hemerocallis esculenta. The prime season to visit runs from mid-June to mid-July. Looking out at the entire Fuji Field Garden from the viewing platform, it looks like a carpet of orange spread out across the land. 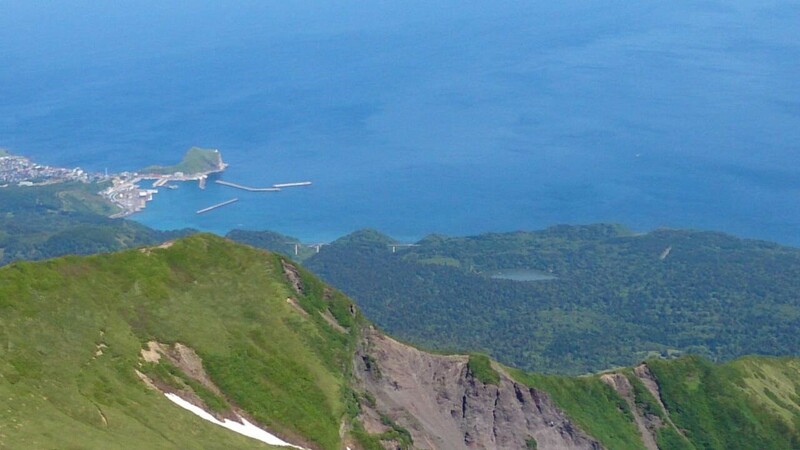 Also visible from the viewing platform is Ponmoshiri Island. The sight of the Hemerocallis esculenta waving in the wind is truly majestic. And a mere 5km drive from the Fuji Field Garden lies the Kanro Spring. It gushes forth midway along Mount Rishiri’s Oshidomari Hiking Route (About a 3rd of the way up) and is loved by the locals for its sweet, delicious waters. 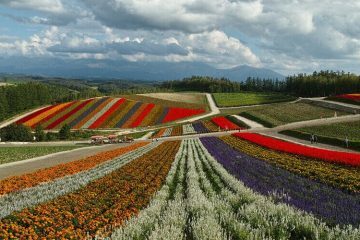 Check it out after a visit to the Fuji Field Garden! Located on the southernmost tip of Rishiri Island, Senhoshi Misaki Park is filled with an assortment of strange rocks and boulders. These were formed by lava flow from Mount Senhoshi-pon. 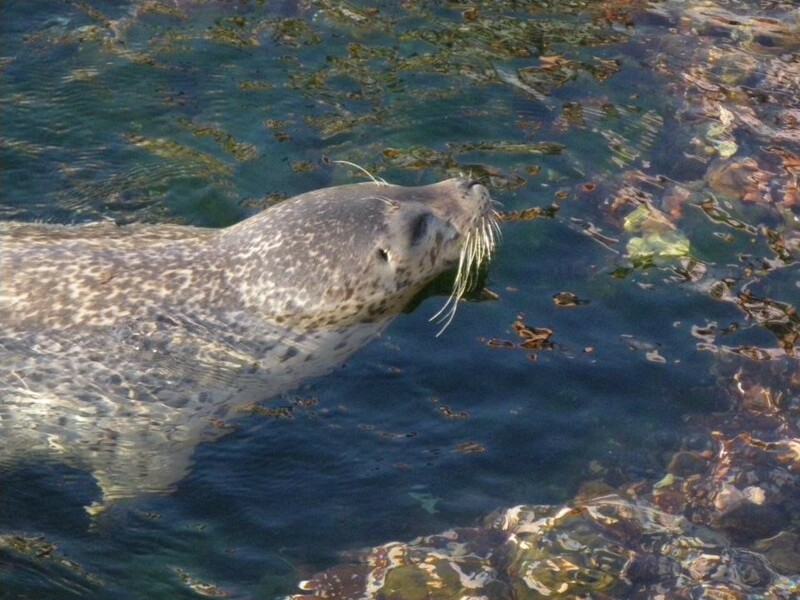 What’s more, wild spotted seals make the ocean waters their home! A nearby souvenir shop has seel feed for sale. The ocean has high transparency, so you can sometimes see seaweed and various forms of wildlife by simply looking into the water. Many kinds of seaweed wash up on Rishiri Island’s shore on a daily basis. 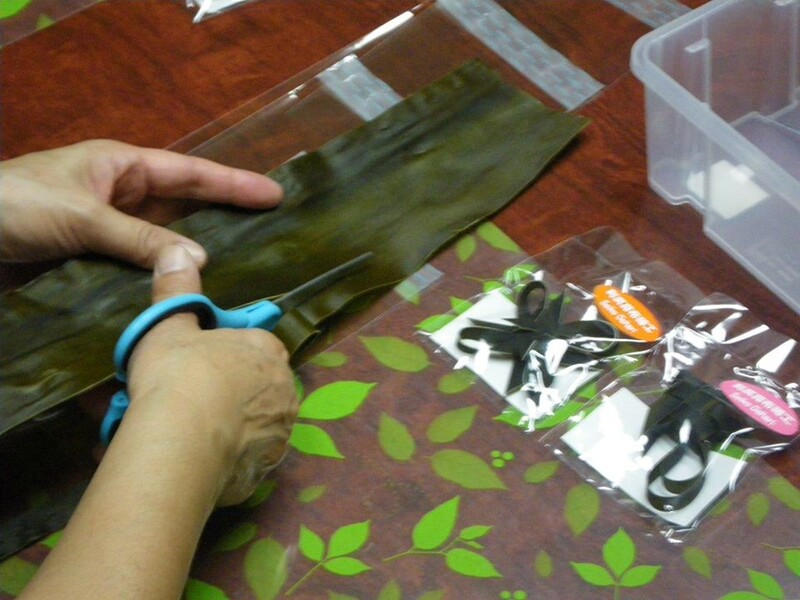 The Island Station sells postcards, bookmarks and keyholders made with this seaweed. 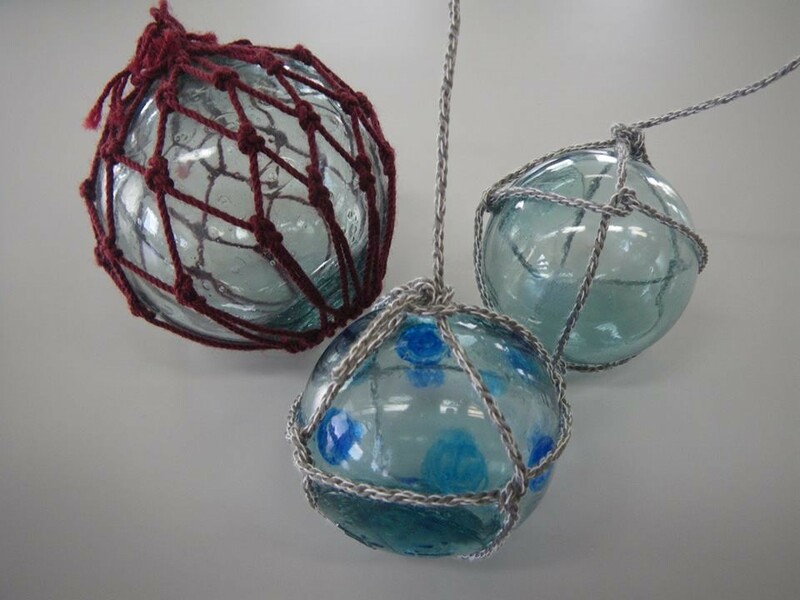 It also offers a variety of hands-on craft workshops. How about making a memento to remember your trip by? Actually this building was built over 120 years ago! 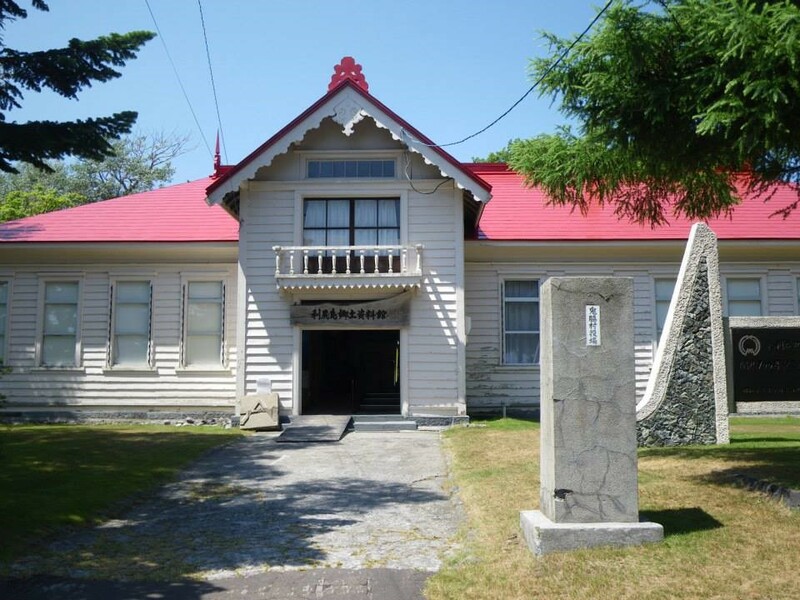 Visitors can set their eyes on the oldest building on the island. Japan is a country with many earthquakes, so you can really feel the fine architecture techniques that have been refined through the years. 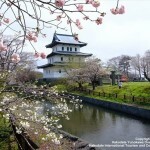 Yuhigaoka can be found as you head towards the north of Rishiri Island. To reach the 45m high viewing platform, visitors must climb about a hundred steps, walk up a long hill road and then ascend a final flight of stairs. It sounds strenuous, but the breathtaking scenery makes for a pleasant climb. 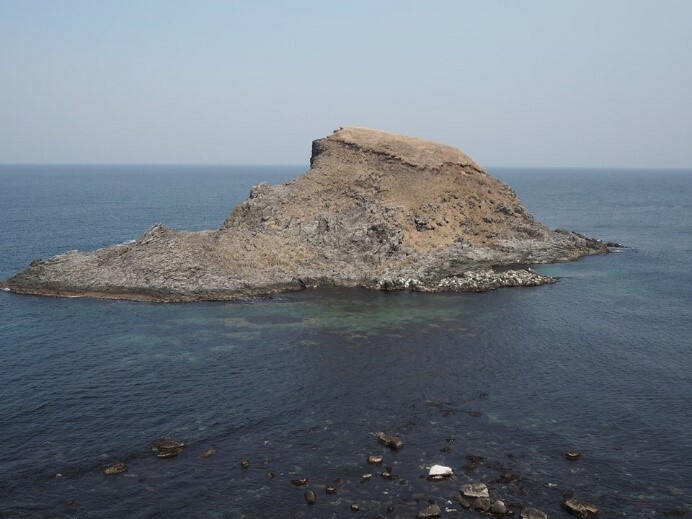 Ponmoshiri Island, which lies out from the platform, is also a home for seabirds. With no buildings block your view here, only from here can you see the sun setting beyond Rebun Island. This shrine has an interesting history. It is said to have been built in thanks to the goddess Benten when a sailing vessel was saved from being smashed into the rocks. The bright red depositories for sacred objects built on top of the Dragon God’s Rock is really draw the attention if the eyes. There is another old legend that remains. It seems that, at sunset, a rumbling something once fell from from the sky and disappeared into the Dragon God’s Rock. The people thought this was bad sign, so they didn’t talk much about it. 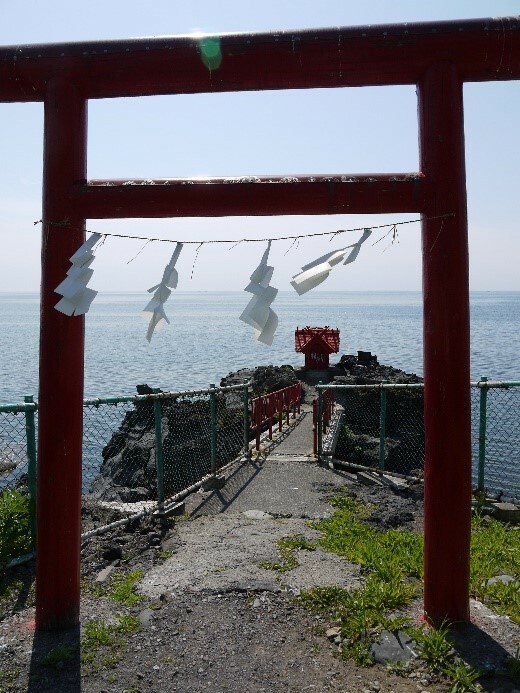 However, one day, a passing monk told everyone to set up small shrines on the rock and pray there. Behind Oshidomari Port lies a giant rocky mountain cape with a height of 90m. 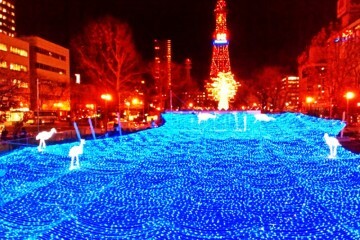 It is a 5 minute walk to the top. It is a bit of a climb along the hill road, but the view is spectacular! 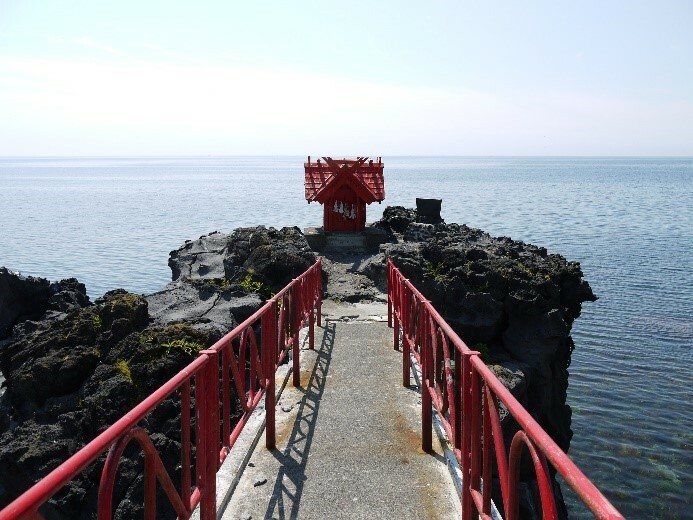 Cape Peshi is also called “Lighthouse Mountain.” This spot has a superb view, and, on clear days, you can see Rebun Island and Wakkanai. You can also enjoy birdwatching around the entire area. 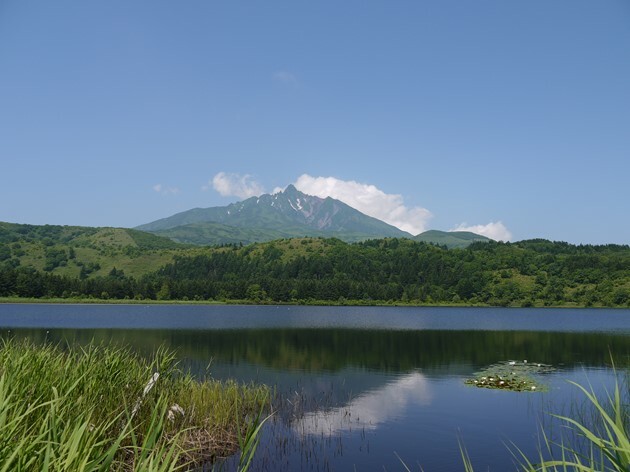 Located between Lake Otatomari and Senhoshi Misaki Park, the Minamihara Wetlands in season are perfect for photography and enjoying the plant life. 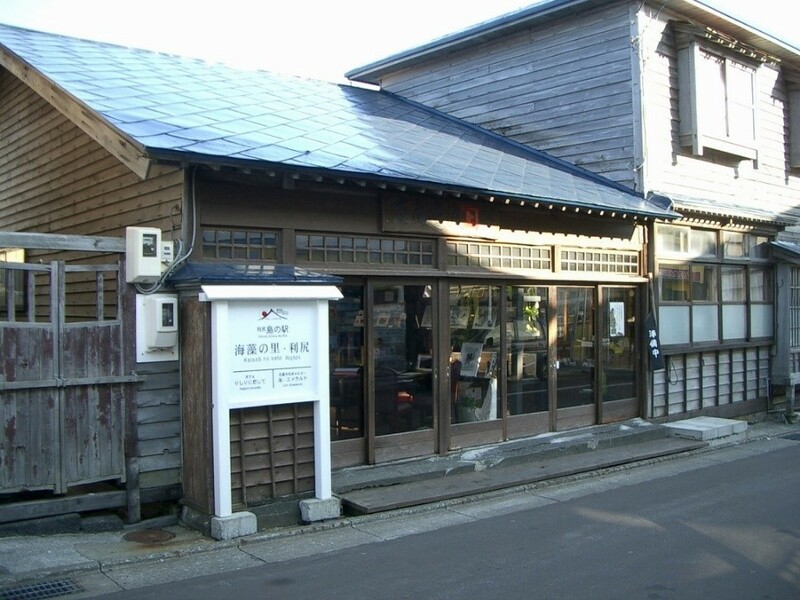 If you plan on driving clockwise and departing from Oshidomari, we recommend that you drop by here after Lake Otatomari. Kombu, or kelp, is one of the island’s noteable products. 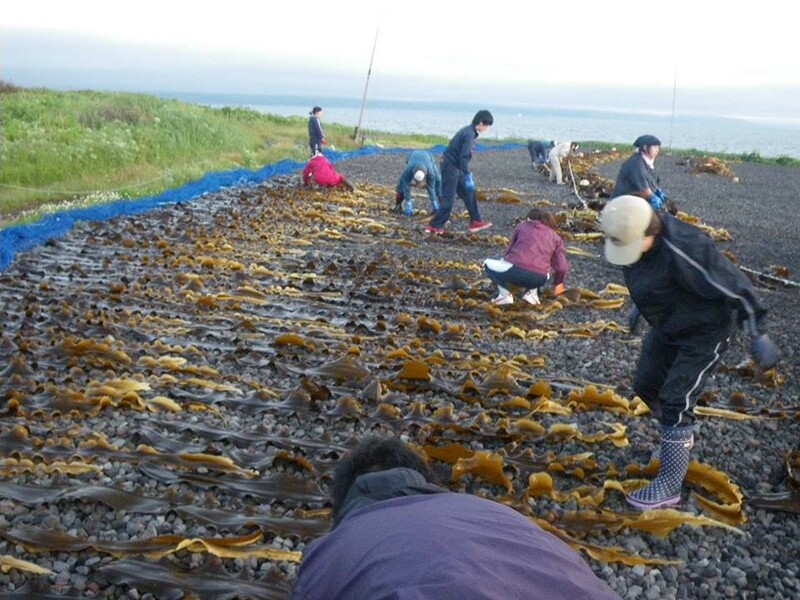 You can find kombu drying in the sands of the coast. There are so many! 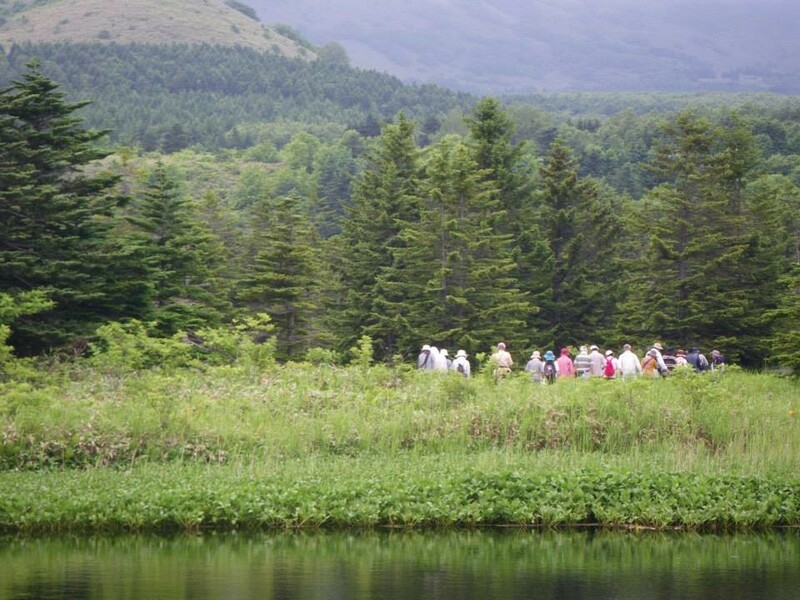 Here you can learn about Rishiri Island’s alpine plants and wild birds. Many local historical items are on display, and there are 4 display booths. The sight of the building backed by the majestic Mount Rishiri is quite spectacular too. On Rishiri Island, strangely shaped clouds can sometimes appear in the blue skies overhead. You can see circular, spiraling lenticular clouds that portend rain over Rishiri Fuji. And many others too! 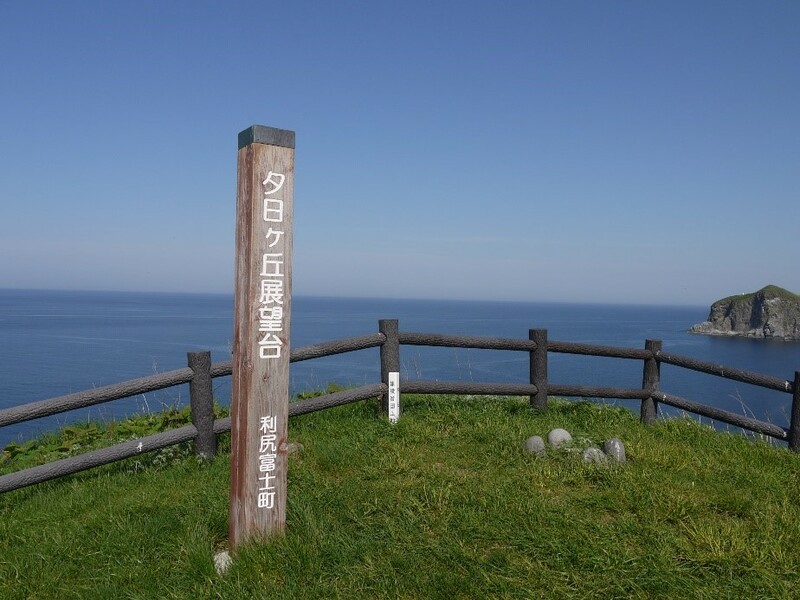 Generally, visitors to Rishiri Island do a clockwise tour around Rishiri Island. For 3 hours of sightseeing, focus on only the main points. With this course, you can can cross over to Rebun Island on the same day. 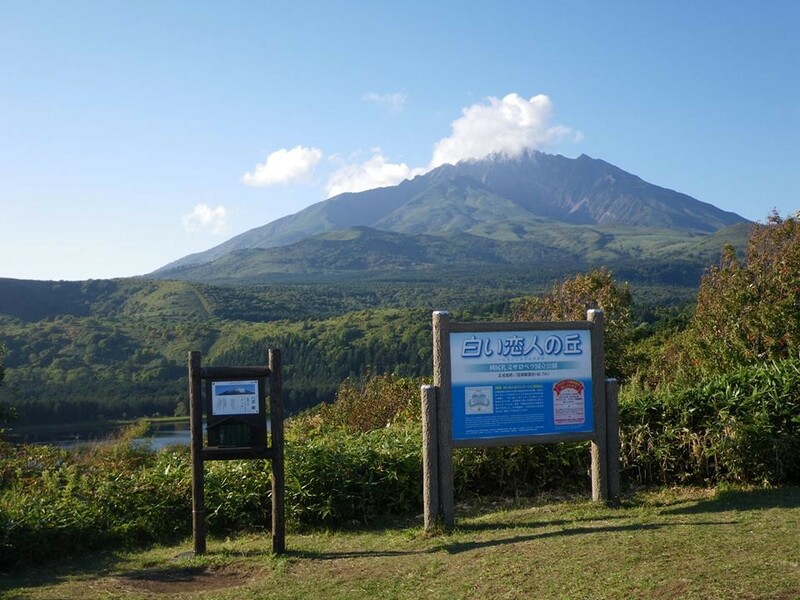 ※It it feels like you have enough time, try stopping by the Minamihara Wetlands or the Cape Peshi Viewing Platform! 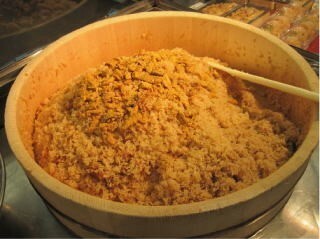 The Unimeshi Bowl can be eaten inside the Oshidomari Ferry Terminal. The finest soup stock made with highest grade natural Rishiri kelp is combined with rich sea urchin for slowly carefully cooked Unimeshi sea urchin rice. 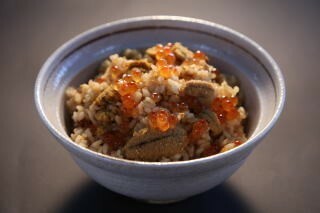 The rice is then topped with a luxurious serving of sea urchin and salmon roe. This delicacy is highly recommended. With soup stock from Rishiri’s natural kelp is Miraku’s Yaki Shoyu Ramen. The soup base is a mix of tonkotsu, chicken bones, and assorted vegetables simmered for a generous 17 hours. This delicious mixture is then combined with soup stock from Rishiri Island’s native natural kelp to make a beautifully blended ramen dish. The soup is rich but with a refreshing aftertaste. 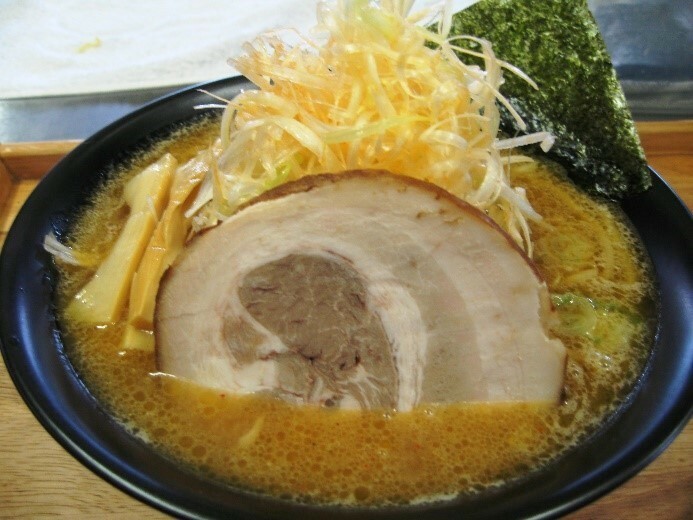 This ultimate ramen that makes use of the ocean’s blessings can only be eaten on Rishiri Island. 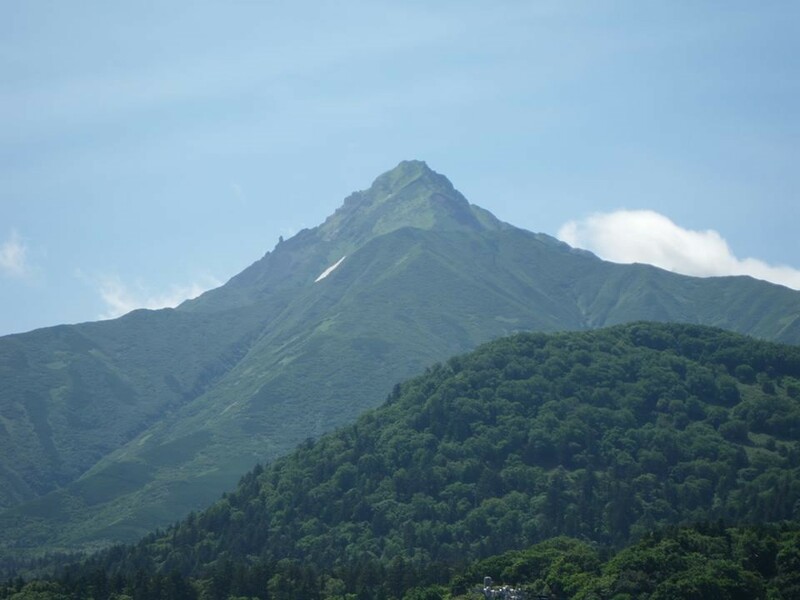 *Incidentally, the ramen has more green onions than normal that are piled in the image of Mount Rishiri. Price: Salt Ramen ¥750・Yaki Shoyu Ramen ¥800・Miso Ramen ¥850, etc. Established in 1937, the Morihara Farm is now closed. However its famous milk drinkMirupisu lives on and is loved even today. Using the original Mirupisu that was made using a base of milk and lactic acid, the drink has undergone many improvements to make today’s drink. We took the weather and recommended clothing from the Meteorological Agency HP for June to October and tried dividing it by month. Entering early summer. Average temperatures of 14 to 15 °C with all-time low of 5 °C and all-time high of 24 °C. 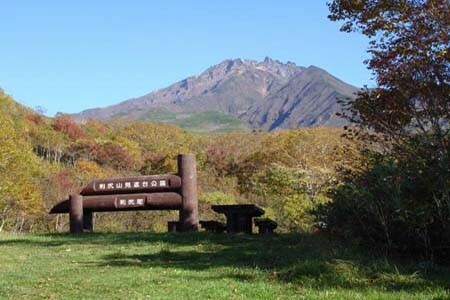 Start of the full-blown mountain-climbing season at Mount Rishiri. Average temperatures of 17 to 18 °C with all-time low of 8 °C and all-time high of 25 °C. Summer approaches its end on Rishiri Island. The temperature falls in the middle of the month and fall begins. Average temperatures of 20 to 21 °C with all-time low of 12 °C and all-time high of 27 °C. Refreshing and comfortable weather. Average temperatures of 17 to 18 °C with all-time low of 7 °C and all-time high of 24 °C. 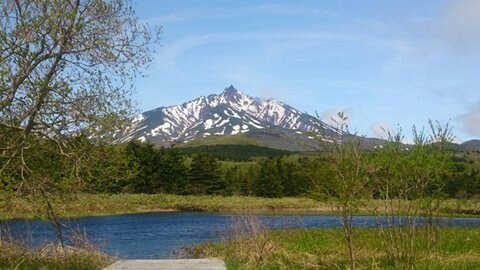 In early October, the first snow-capped peak of Mount Rishiri can be seen. 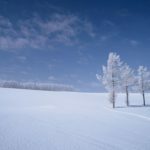 At the end of the month, snow falls and Rishiri Island enters winter. Average temperatures of 12 °C to 13 °C with all-time low of °C and all-time high of 19 °C. Long sleeves and pants are standard. Shirts and blouses recommended even during the day. The mornings and evenings are chilly, so bring an something light to put on. Short sleeves and pants are OK! However, if you plan on sightseeing in higher eleveation locations, we recommend a T-shirt and long pants. The pants are to protect you from the cold and injuries that come from bugs and brushes along the mountain paths. *Evenings and mornings are cold even in summer, so bring something light to put on. Bring winter clothing. Bring a thick sweater, pants, and something thick to put on like a jacket or fleece coat. Two important things to prepare are rain gear and anti-insect measures. Rishiri Island doesn’t have many obstructions, so the rain and win often come down sideways. A folding umbrella is not enough. 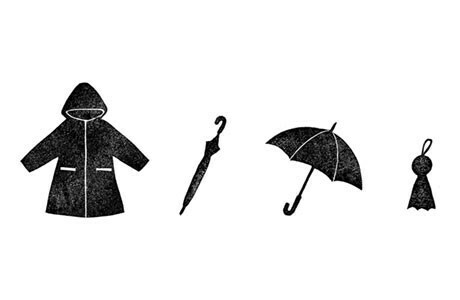 Be sure to put a raincoat in a vacuum bag and bring it with you. If it’s raining in the morning, go out with (waterproof) rain boots. 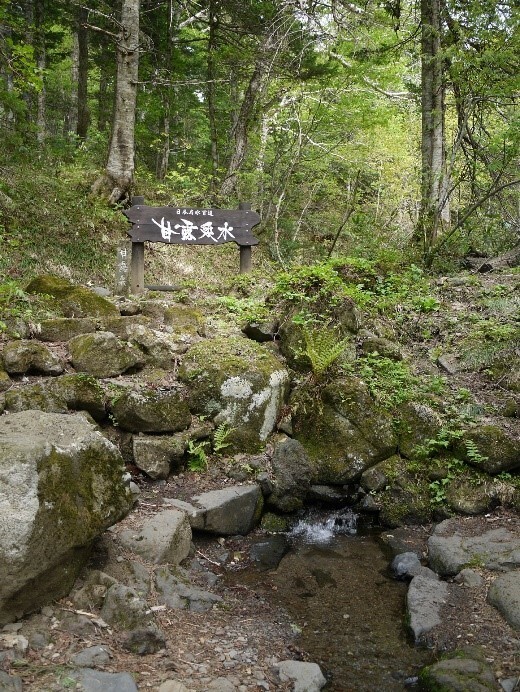 Most of the spots on Rishiri Island involve walking around in nature. 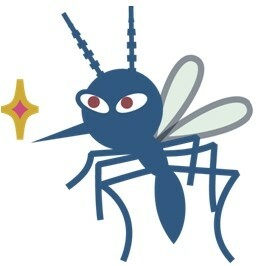 In the mountains you will be stung even with repellant, but it should protect you a little bit. A saline solution is a cure-all! Make it yourself with a target concentration of 20% or above. Use a spray bottle and use 20g or more of salt for 80cc of water. Why bring a saline solution? If a leech attaches to your body, you can use spray it and make it fall off. Also, it makes for an effective repellant if you spray it around easily penetratable locations such as around your neck, wrists, ankles and hat.